I’ve been spending a fair bit of time reading, studying, writing, and presenting as part of Officer Candidate training in the Washington State Guard. When I’m pinned I may be one of the oldest 2nd Lieutenants you’ve ever imagined (most of my contemporaries are Lieutenant Colonels and Colonels) but I will have learned beyond measure. As much of our last drill weekend was spent immersed in Army operations I’ve become quite familiar with Army Field Manuals 5-0 The Operations Process and 1-02 Operational Terms and Graphics. Chapter 2 of FM 1-02, Section 1 includes acronyms and abbreviations and it was there I spotted it, the acronym for command, control, and communications countermeasures: C3CM. This gem is just ripe for use in the cyber security realm and I intend to be the first to do so at length. C2 analysis may be good enough for most but I say let’s go next level. ;-) Initially, C3CM was most often intended to wreck the command and control of enemy air defense networks, a very specific Air Force mission. Apply that mindset in the context of combating bots and APTs and you’re onboard. Our version of C3CM therefore is to identify, interrupt, and counter the command, control, and communications capabilities of our digital assailants. Part one of our three part series on C3CM will utilize Nfsight with Nfdump, Nfsen, and fprobe to conduct our identification phase. These NetFlow tools make much sense when attempting to identify the behavior of your opponent on high volume networks that don’t favor full packet capture or inspection. 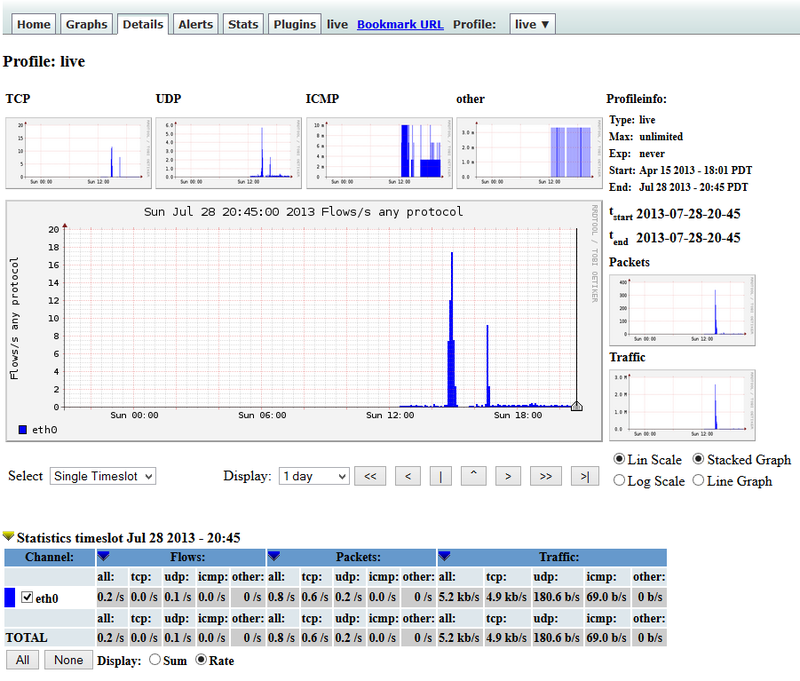 5) Nfsight, our primary focus, as detailed on its Sourceforge page, is a NetFlow processing and visualization application designed to offer a comprehensive network awareness. Developed as a Nfsen plugin to construct bidirectional flows out of the unidirectional NetFlow flows, Nfsight leverages these bidirectional flows to provide client/server identification and intrusion detection capabilities. Nfdump and Nfsen are developed by Peter Haag while Nfsight is developed by Robin Berthier. Robin provided extensive details regarding his project. He indicated that Nfsight was born from the need to easily retrieve a list of all the active servers in a given network. Network operators and security administrators are always looking for this information in order to maintain up-to-date documentation of their assets and to rapidly detect rogue hosts. 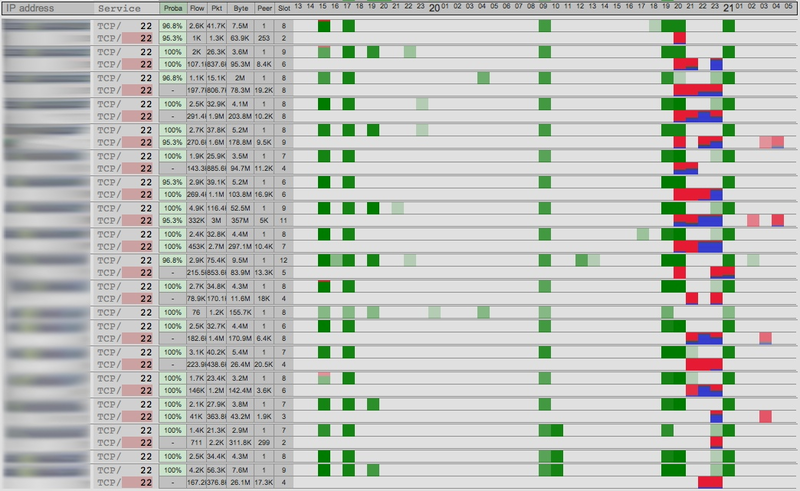 As mentioned above, it made sense to extract this information from NetFlow data for practicality and scalability. Robin pointed out that NetFlow is already deployed in most networks and offers a passive and automated way to explore active hosts even in extremely large networks (such as the spectacularly massive Microsoft datacenter environment I work in). The primary challenge in designing and implementing Nfsight lay in accurately identifying clients and servers from omnidirectional NetFlow records given that NetFlow doesn't keep track of client/server sessions; a given interaction between two hosts will lead to two separate NetFlow records. Nfsight is designed to pair the right records and to identify which host initiated the connection and does so through a set of heuristics that are combined with a Bayesian inference algorithm. Robin pointed out that timing (which host started the connection) and port numbers (which host has a higher port number) are two examples of heuristics used to differentiate client from server in bidirectional flows. He also stated that the advantage of Bayesian inference is to converge towards a more accurate identification as evidence is collected over time from the different heuristics. 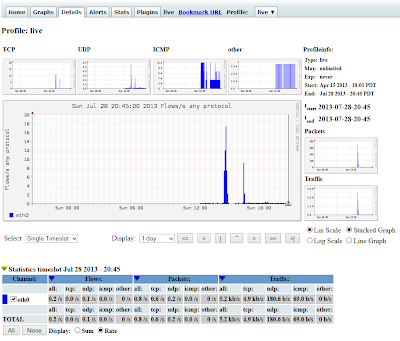 As a result, Nfsight gains a comprehensive understanding of active servers in a network after only few hours. Another important Nfsight feature is the visual interface that allows operators to query and immediately display the results through any Web browser. One can, as an example, query for all the SSH servers. Robin described the investigation of the operating systems on those SSH servers where the sysadmins found that they were using a shared password database that an attacker was able to compromise. The attacker then installed a bot in each of the server, and launched a scanning campaign from each compromised server. Without the visual representation provided by Nfsight, it would have taken much longer to achieve situational awareness, or worse, the attack could have gone undetected for days. I am here to tell you, dear reader, with absolute experiential certainty, that this methodology works at scale for identifying malicious or problematic traffic, particularly when compared against threat feeds such as those provided by Collective Intelligence Framework. Think about it from the perspective of detecting evil for cloud services operators and how to do so effectively at scale. Tools such as Nfdump, Nfsen, and Nfsight start to really make sense. Now that you’re all excited, I will spend a good bit of time on installation as I drew from a number of sources to achieve an effective working base for part one of our three part series of C3CM. This is laborious and detailed so pay close attention. I started working from an Ubuntu Desktop 12.04 LTS virtual machine I keep in my collection, already configure with Apache and MySQL. One important distinction here. I opted to not spin up my old Cisco Catalyst 3500XL in my lab as it does not support NetFlow and instead opted to use fprobe to generate flows right on my Ubuntu instance being configured as an Nfsen/Nfsight collector. This is acceptable in a low volume lab like mine but won’t be effective in any production environment. You’ll be sending flows from supported devices to your Nfsen/Nfsight collector(s) and defining them explicitly in your Nfsen configuration as we’ll discuss shortly. Keep in mind that preconfigured distributions such as Network Security Toolkit come with the like of Nfdump and Nfsen already available but I wanted to start from scratch with a clean OS so we can build our own C3CM host during this three part series. From your pristine Ubuntu instance, begin with a system update to ensure all packages are current: sudo apt-get update && sudo apt-get upgrade. You can configure the LAMP server during VM creation from the ISO or do so after the fact with sudo apt-get install tasksel then sudo tasksel and select LAMP server. You’ll be asked two question during this stage of the install. The fprobe install will ask which interface to capture from; typically the default is eth0. For Collector address, respond with localhost:9001. You can opt for a different port but we’ll use 9001 later when configuring the listening component of Nfsen. During the mrtg install, when prompted to answer “Make /etc/mrtg.cfg owned by and readable only by root?" answer Yes. You may notice errors that include pack_sockaddr_in6 and unpack_sockaddr_in6; these can be ignored. Run sudo /var/nfsen/bin/nfsen status to ensure that Nfsen is running properly. You’re halfway there now. Check your Nfsen installation via your browser. The URL is http://192.168.42.131/nfsen/nfsen.php?tab=0 on my server. Note: if you see a backend version mismatch message, incorporate the changes into nfsen.php as noted in this diff file. As data starts coming in (you can force this with a ping –t (Windows) of your Nfsen collector IP and/or an extensive Nmap scan) you should see results similar to those seen from the Details tab in Figure 2 (allow it time to populate). Interchange the root user with an Nfsight database user if you’re worried about running the Nfsight db with root. 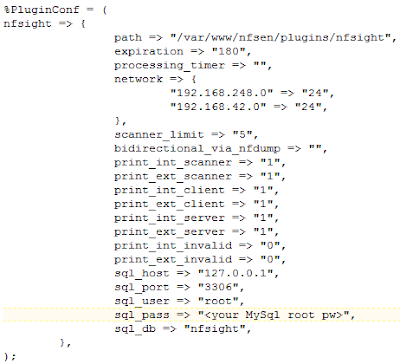 Edit /var/nfsen/etc/nfsen.conf with settings from the Nfsight installer.php output as seen in Figure 3. Congratulations, you should now be able to login to Nfsight! 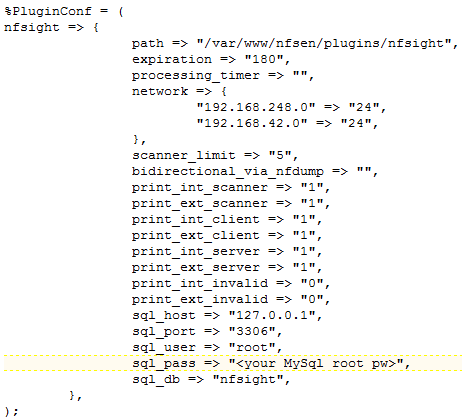 The credentials to login to Nfsight are those you defined when running the Nfsight installer script (installer.php). On my server, I do so at http://192.168.42.131/nfsen/nfsight/index.php. After all that, you’re probably ready to flame me with a “WTF did you just make me do, Russ!” email. I have to live up to being the tool in toolsmith, right? I’m with you, but it will have been worth it, I promise. As flows begin to populate data you’ll have the ability to drill into specific servers, clients, and services. I generated some noisy traffic against some Microsoft IP ranges that I was already interested in validating which in turn gave the impression of a host on my network scanning for DNS servers. 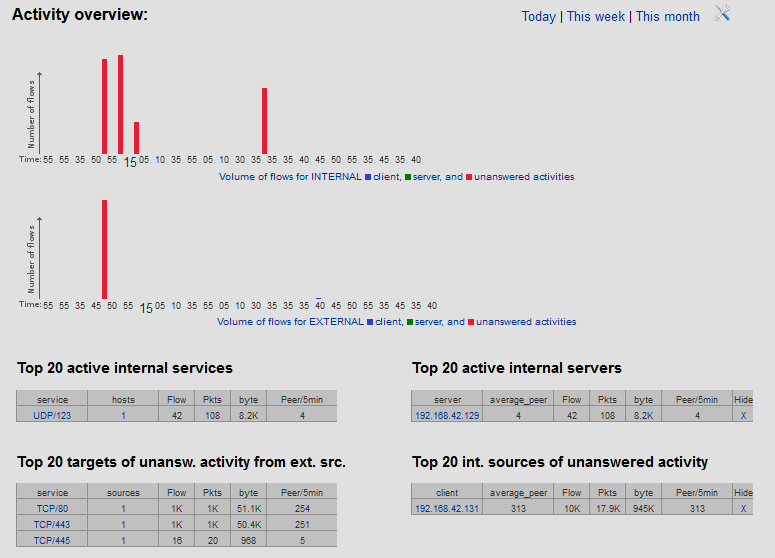 Figure 4 show an initial view where my rogue DNS scanner shows up under Top 20 active internal servers. You can imagine how, on a busy network, these Top 20 views could be immediately helpful in identifying evil egress traffic. If you click on a particular IP in a Top 20 view you’ll be treated to service activity in a given period (adjustable in three hour increments). 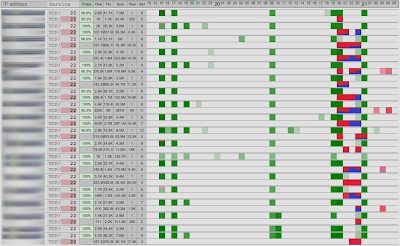 You can then drill in further by 5 minute increments as seen in Figure 5 where you’ll note all the IPs my internal hosts was scanning on port 53. You can also render a parallel plot (courtesy of PicViz installed earlier). Every IPv4 octet, port number, and service are hyperlinks to more flow data, so just keep on clicking. When you click a service port number and it offers you information about a given port, thanks to the SANS Internet Storm Center as you are directed to the ISC Port Report for that particular service when you click the resulting graph. 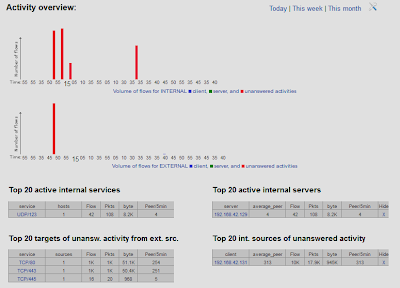 All functionality references are available on the Wiki, must importantly recognize that the color codes are red for unanswered scanner activity, blue for client activity, and green for server activity. You can select save this view and create what will then be available as an event in the Nfsight database. I saved one from what you see in Figure 5 and called it Evil DNS Egress. These can then be reloaded by clicking Events from the upper right-hand corner of the Nfsight UI. Nfsight also includes a flow-based intrusion detection system called Nfids, still considered a work in progress. Nfids will generate alerts that are stored in a database and aggregated over time, and alerts that are recorded more than a given number of time are reported to the frontend. These alerts are generated based on five heuristic categories including: malformed, one-to-many IP, one-to-many port, many-to-one IP, and many-to-one port. You can also manage your Nfsight settings from this region of the application, including Status, Accounts, Preferences, Configuration, and Logs. You can always get back to the home page by simply clicking Nfsight in the upper-left corner of the UI. Nfsight, as part of our C3CM concept, represents the first step (and does a heck of a good job doing it) of my C3CM process: identify. Next month we’ll discuss the interrupt phase of C3CM using BroIDS and Logstash.